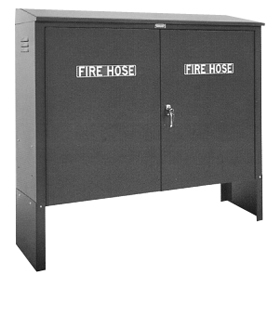 Heavy Duty hose equipment house to store fire hose and accessories for yard use. 16 gauge cold-rolled steel standard with galvanized steel or aluminum as an option. Red baked enamel finish with 'Fire Hose' decal standard. Cabinet measures 58" wide x 15" deep x 42" high. The 14 gauge steel removable legs are 18" long. Complete with adjustable center shelf. Ventilation louvers on each side. 2 - 369P Female Male Adapter 2 1/2" x 1 1/2"
1 - 472 Leader Line Wye 2 1/2" x 1 1/2" x 1 1/2"